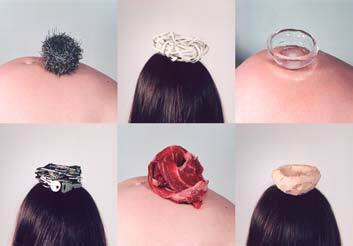 Photography, drawings, objects and videos. Monika Rühle refers to the concept of the nest syndrome as the impulse that a woman feels from the moment of her pregnancy to prepare herself and her environment for the welcoming of her new born baby. 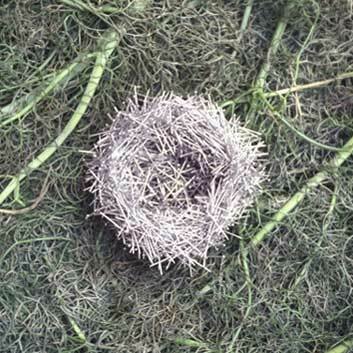 An archive of artificial nests. There are approximately 20 nests that have a similar size to that of a sparrow's. The nature of these nests if often artificial and there is a strong clash between the nest and its environment. Often the nest doesn’t fit into its’ surroundings, an intrusion occurs. 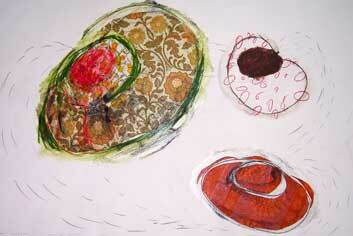 Drawings, each 114 x 75 cm large, mixed media. The nest reflects the complicated and complex emotional relationship between mother and child; instincts and desires, its moments of great happiness, understanding and love, and also the difficult task of educating. 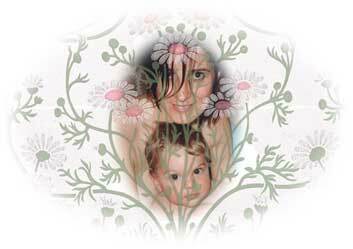 The feelings are the source for the bonding of the relationship between mother and child. The images are stamped on a hanging cloth in the form of a curtain. Inside you will find a painted wall covered with memories: objects, framed photos, drawings, autobiographies. It’s my private space. 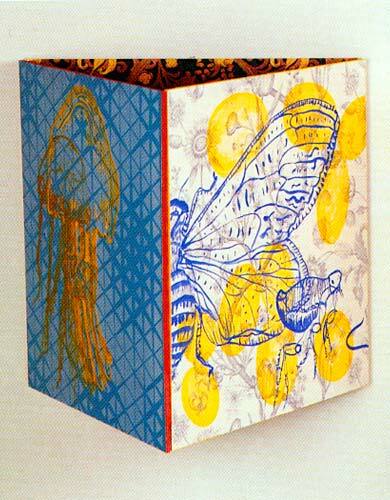 I have elaborated some images made up from my personal album, of treasured moments shared with my children, with drawing of painted papers that I used in previous series since 1996. The images are sweet and intimate, sincere and real combined with exuberant floral designs for the 70´s. An archive of images from my daily family life. They are little moments of happiness. What is a home? Could it be a place, a stack of things, or people who live there, constantly transforming it? These images witness a constant change of state of intense experiences. It’s an attempt to reflect my environment, my life in those moments of family life; to show how a certain space portrays its habitants and is constantly victim of their lives. Nothing is what it used to be. 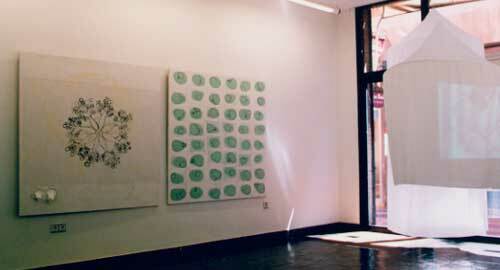 Paintings, screen prints, objects and video. Thoughts on breastfeeding. The audience enters a room shaped as breast and see a video projected from inside. On the floor there are two huge breast made from white imitated leather. They are actually poufs where you can lie down and listen to a soft German lullaby irradiate from within. On the walls; an apron, a waistcoat and a tie. Multiple breasts hang in a row reminding us of udders brimming with milk. Material: video "Misterio de la Leche" proyectado sobre una escultura de tela, 2 pufs en forma de pecho, vestuario colgado en la pared, pinturas y serigrafías. The photo romance Paradise is made up of 80 slides where the happy couple spend their adventurous lives together. From the creation of Adam, Adam’s rib operation, the creation of Eve, episode with the tiger, encounter with the Almighty, reforestation of Paradise, through to expulsion and finally a happy ending. The photo romance with plastic dolls is set on a painted backdrop with its warm tones reminds us of a biblical hell. The 80 slides are projected in a closed space on 5 stretched tulle curtains. The picture is replicated in space and increases with the distance. Visitors can enter into the installation and feel themselves totally submerged in a coloured space. Here the Wallpaper of FLOOD is mounted on canvas and as an independent "image" re-edited. I had painted for flood hundreds of meters of colourful flower-wallpaper with protozoa and insects. They now form part of my project paradise together with the photo series Paradise, retelling a free adaptation of the story of Adam and Eve. These insects are walking around here so boldly on the colourful murals. They are actually derived from the biology book. These extravagant designs on wallpaper represent their natural environment, their personal world. These tiny creatures have souls. Undoubtedly, the origin of their wings is a divine trick. Because of India's Jain religion minerals have a soul, plants have two, animals and people even three. Acrylic painting on wallpaper. Variable dimensions. 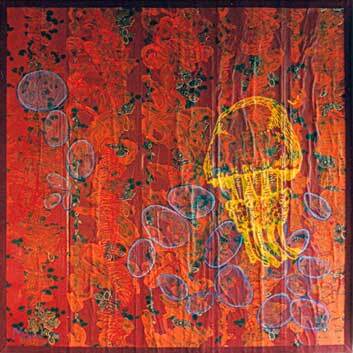 I have painted on wallpaper single-celled organisms, protozoa, insects and aquatic animals. The idea was to totally flood the room. 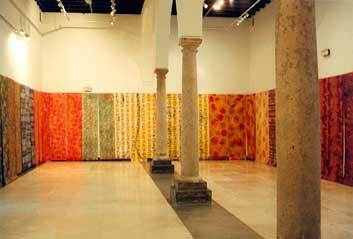 Wallpapers have fascinated me since my lino-series ARCA in 1995, but they got my passion with the installation of Hostal Roca in 1996. Since then I've painted on hundreds of meters of wallpapers with extravagant floral patterns from the 60s and 70s. The installation consists in strips of wallpaper hanging from the ceiling, that fills the walls completely, thus creating the illusion of flooding. Acrylic painting on painted paper placed on a three board mobile triptych. Extended size 180 x60 cm. Circuits of Young Art from the Madrid Community, exhibition tour at the Centre for Young Art Madrid, Barcelona, Valencia, Oviedo, Pontevedra, Salamanca, Granada, Bremen and Berlin. Angels have wings, at least in medieval paintings. What else are insects but small winged messengers? The metamorphosis of the butterfly appears with the hermetic and protected eggs along side parasites such as fleas and lice. El soporte de tríptico no fue una elección casual. ¿Acaso esconde el retablo en su interior más ángeles? 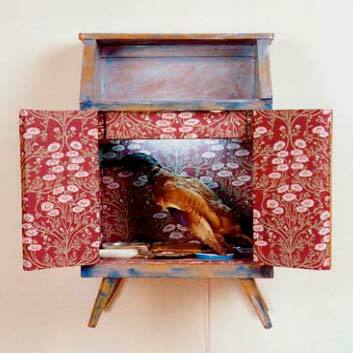 Estoy recuperando la tradición de la pintura-retablo, la búsqueda de lo sagrado ligado al arte, pero desde un contexto contemporáneo consumista destinado a reciclar. Pintura acrílica sobre papel pintado montado sobre tríptico móvil en tres tableros, abierto 180 x 60 cm. "When I found in my studio remains from the old abandoned hostel, HOSTAL ROCA, I started to imagine the lives of its residences. 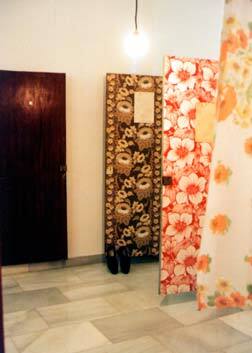 The rooms were fully furnished and equipped with incredible wallpapers. In each room there was a closet that includes many personal objects of the former residents. The wardrobes of the ten tiny rooms were crammed with all sorts of junk: X-rays, clothing, photos, drugs, lottery tickets, toiletries, etc. " The series of four bedside tables reflects the situation of isolated living cells. There are floating reminders of a past reality, captured in time. A video with footage from the old hostel went in a closet that was lying on the floor. En general, la práctica artística de la instalación casi la ha convertido en el ‘hipergénero dominante” (G. Solana) en nuestros días, pero algunas de ellas, en las que se advierte un dominio maestro del género, tienen, nunca mejor dicho, “cosas” que decir. Es el caso de “Hostal Roca”, una grandiosa instalación con la que Mónika Rühle ha ocupado la sala inferior del Centro de Arte Joven de la Comunidad de Madrid –y también ha llenado buena parte del espacio artístico reseñable en esta ciudad-. En “Hostal Roca” aparecen recopilados y dispuestos algunos de los efectos ersonales y enseres domésticos, algunas de las “cosas” que dejaron abandonadas hace unos años, después de un desalojo forzoso, los habitantes del verdadero Hostal Roca, de Madrid. En “Hostal Roca”, a mí parecer, está artísticamente muy bien resuelta, con un estilo vigoroso, la eterna cuestión artística de las relaciones entre el signo y lo significado, que, por influencia, entre otras cosas, del postestructuralismo, lleva unas décadas compareciendo –tanto en la teoría como en la praxis artística- de modos nuevos, que se muestran recisamente en las instalaciones. vivieron y dieron sentido a todo aquello hubieran salido un día normal a una hora corriente; solo que — como el Wakefield de Hawthorne — no volvieron jamás. es el tipo de trabajo magníficamente llevado a cabo en este caso. signos de algo (de una cosa o de otros signos); lo propio de las cosas, en cambio, es que solo viven en si mismas. Un cuadro de, digamos, una escena campestre, “representa”, pero naturalmente no es lo representado, sino un signo separado de la cosa significada. En una instalación, en cambio, curiosamente, signos y cosas están separados y al mismo tiempo unidos: lo característico de la instalación es que su escenario esta constituido por cosas que cohabitan con sus signos (y viceversa); manipulado con intencionalidad artística, ese tipo de “escenario” (M. Rühle ha trabajado también, aparte de pintando, en la ambientación de piezas teatrales) acaba poseyendo la atmósfera típica de la instalación: la de una ambigua hiperrealidad. Cuando accedemos a ella, sabemos que asistimos a algo hecho con intencionalidad artística, sin embargo, lo que encontramos allí son “cosas”, y tan ordinarias y corrientes que nos resulta difícil atribuirles algún carácter de signo; nos hace interrogarnos si los objetos “instalados” remiten a otra realidad, si significan algo distinto de si mismos, o no lo hacen. Si son signos o cosas. Installation. Woodcut print series of 2 x 1 m high, on tracing paper. Referring to the five hundredth anniversary of the discovery of America, linking the discovery of the human body with the discovery of the New World. 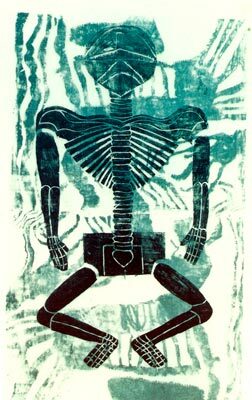 anatomical drawings of medieval manuscripts from China, India and France were used as a source of inspiration.